It was almost Christmas Eve when I snapped this quick photo of our 3-years-old. 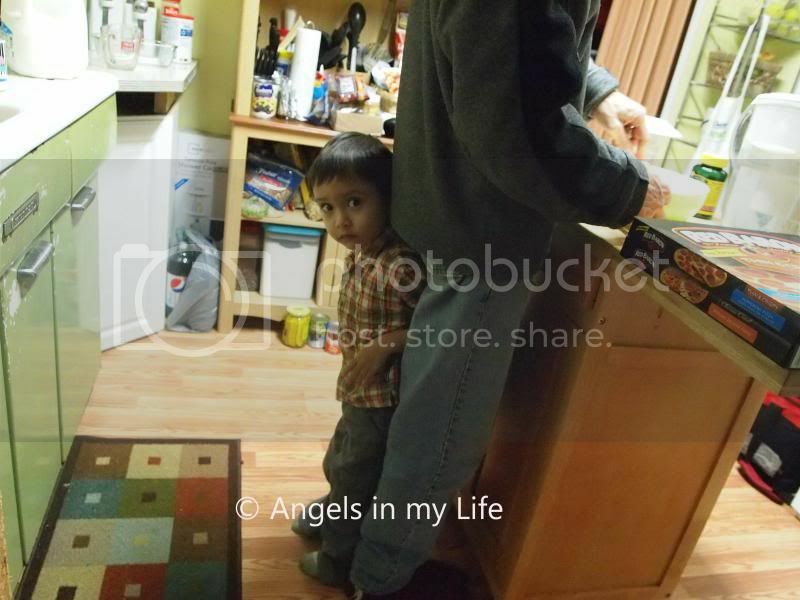 He was I believe sneaking on what his Papa was doing. I don't exactly remember the scene between the two, as I just went to the kitchen to see what's I can do. I need to be quick to captured a good and non-blurry picture of our son and this one turns out to be a great photo so here I am. Kids can be so fun and sometimes they can be so frustrated. It's the matter on how and what parents do in order for kids to be obedient and respectful. And for parents to be more patience when their kids starts to try their patience. Children needs space and time to discover their true personality. The growing up years for them. He looks so cute hiding from you. Love how he looks so innocent, kind of saying "I am not doing anything wrong" lol. "Mom, I'm not doing anything, promise." :) You said it right. They're so lovable but they really love trying our patience. And it's all up to us how we're going to handle them. He can run but he can never hide from mamarazzi who always carry her camera and snap photos of this cute little man ha ha.